In the summer of 2009 I finally found Waitsfield, Vermont and the meandering driveway that led to the Von Trapp dairy farm. That was after the GPS sent me down a logging trail, a bee got stuck in my tank top, stung me, and I nearly hit a tree. Few cheeses are worth that kind of drama, but I was delighted to find (and still am) that Sebastian and Dan’s cheese, Oma, is one. Although they make only two batches of cheese every other week from the thick, golden, unpasteurized milk of the family’s predominantly Jersey cow herd, we’re lucky enough to sell it at Murray’s. 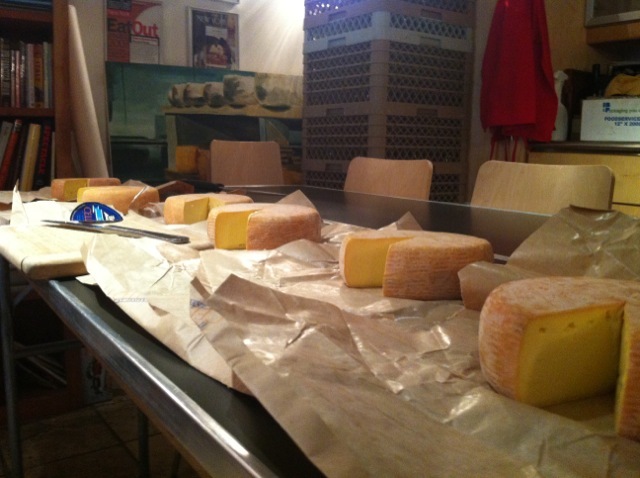 It’s a brilliant collaboration, the effort of two third generation dairy farmers to improve upon their parents’ organic model by making a singular cheese that is aged at the Cellars at Jasper Hill. When you hear about seasonal cheese it immedaitely seems fleeting–rare, precious, and necessary to taste NOW. But all cheeses, even those like Oma that are made year-round, have moments where you can feel and taste the unique conditions of their making. And right now this cheese is exceptional. Why? Because Von Trapp cows are processing a late winter diet of organic hay studded with fat clover buds and all that fodder (and not much walking through snowy hills) is giving an especially thick, rich, fat-and-protein laden milk. 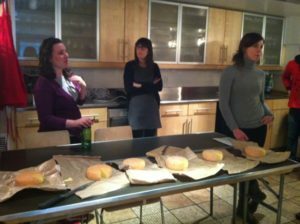 To ensure that the wheels this March are the absolute best I dragged a group of devout cheese proselytizers from the Murray’s ranks into our classroom to blind taste 6 different batches of Oma. Breaking through the nectarine-colored crust of each wheel, we found interior pastes ranging from custardy to springy, and a windfall of flavors reminiscent of eggy French Reblochon to decidedly bacony quiche. All 6 were lovely, but we chose those with a stickier, more elastic texture and balanced, savory. No bitter bite that can happen with this style. It’s hard work, but someone has to do it, and we want you to get the best. PS: Yes, they’re the same family as the singing Von Trapps but the focus these days is on the music of milk.